// Methods from ISimphw follow. // Methods from ::android::hidl::base::V1_0::IBase follow. This is the best DEMONSTRATION of How to get a HAL going I have found, Unfortunately When following it through on OREO my service fails to load the impl library from the ‘HW’ dir, if I push the library up a level to the lib64, it is found. I see nearly all the other standard(or BSP) HALS are lOAded from ‘HW’ but I cant see what they have different. Whats the trick ? HAVE you FIGURED OUT WHY THIS IS HAPPENING? I AM CURRENTLY HAVING THIS ISSUE. PLEASE LET ME KNOW IF YOU FIND ANY SOLUTION. a simple way to avoid it, just copy so file to /system/lib. then it’s gone. but it seems not a good way. if anyone knows it. Hi I resolved it by avoding linking *-impl.so file. and modified service.cpp as below. maybe linking *-impl.so in /vendor/lib/hw is not allowed. instead, I’m guessing that it’s automatically loaded by using HIDL_FETCH_ISIMPHW. @JIHYUN: I followed your steps but still get the following error. hwservicemanager: getTransport: Cannot find entry android.hardware.simple@2.0::ISimphw/default in either framework or device manifest. 10-18 01:06:20.990 1577 1577 E android.hardware.graphics.allocator@2.0-service: Could not get passthrough implementation for android.hardware.simple@2.0::ISimphw/default. I do the the hidl fetch method but don’t know why it is coming this way. Any suggestions? I have been stuck in this. Please note the error is not with the naming convention. Kindly ignore the part where the name is android.hardware.simple1@2.0-impl. I have the correct impl file name. What IDE to run the code? thanks a lot, works great. Required to update dev/*/* in Android.bp in root directory to dev/*/*/* to access the Android.bp created in device/generic/goldfish/simphaltest. I tried steps given for “android.hardware.simple@2.0″ HIDL interface and thats worked. I like the simple steps/command to generate HIDL impl and HIDL service, it really gives the confidence for who are new into Android HAL framework. i dont make android.mk files about simple directory. and i got a message about this. dont find a android.mk file. In service.cpp, should “return 1” “if(res != 0)”, else would “joinRpcThreadpool();” without a registered instance of SimpleHardware. P/S: Sorry about all caps. something wrong somewhere i can’t type in lowercase. Also need “return 1” “if(ser == nullptr)”. How did you get “hidl-gen” and “update-makefiles.sh” to detect your *.hal files if you put your source code under device/generic/goldfish/simphaltest? or did you generate everything under hardware/interfaces and moved them to device/generic/goldfish/simphaltest later? Thanks! IS THERE A WAY TO IMPLEMENT A BOARD/TARGET SPECIFIC VERSION OF THIS AND ‘OVERWRITE’ (OR NOT USE) THE DEFAULT IMPLEMENTATION? E.g. using device/generic/marlin/SIMPLE rather than hardware/interfaces/SIMPLE? 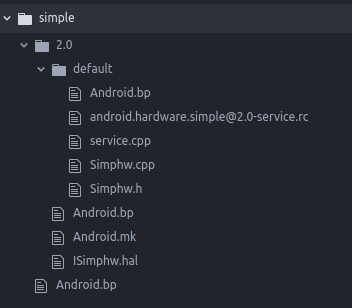 As you’d mentioned, update-makefiles.sh doesn’t seem to detect *.hal files under devices/*, so this has to be done manually, but how should the terms android.hardware.SIMPLE@2.0-impl and android.hardware.SIMPLE@2.0-service AND android.hardware.SIMPLE@2.0-service.rc be renamed for the BOARD/TARGET? Thanks in advance. My test code path is here aosp8/device/generic/goldfish/mysimptest. it’s a great tutorial to get started with HIDL implementation. I am just facing an issue, while build the hidl modules. I am trying to implement an I2C DAC in android to allow the driving of specific voltages from an app. This isn’t a DAC for audio etc, it is an embedded application. I will also be implementing ADC, GPIO etc. Now I am trying to understand how HIDL, HAL etc fit in to this. – I have found an example (https://elinux.org/images/f/fb/Android_Customization-_From_the_Kernel_to_the_Apps.pdf) which seems to create a custom service to control a hardware device, however this edits some of the internal files in android to start the service etc, and therefore I think this is NOT the “Andriod Oreo” way of doing it, since these modifications will be wiped during an upgrade. – Other examples I have found seem to be for sensor implementation. Since the DAC is an output, I don’t think the sensor API is compatible with what I am trying to achieve. As I understand it, Android Oreo 8.0 introduced the treble concept to allow the operating system to be updated while keeping the vendor specific changes intact. Am I correct in saying that this example is compatible with communicating with a custom device? e.g. instead of doing “return valueIn+100;”, I could “open(DEV, O_WRONLY);” etc and interface with my device? Does anyone know how I would call the function from within an Android App using Android Studio? I have generated an SDK after implementing this but I don’t know what Java API is exposed, if any? I am not able to send data to another shared library from my HIDL server, I am sending some data form client to server, from server i am trying to send to another library which is normal C implementation, i am able to call but data is not reaching. Can you please help. Could you please clarify what should be the setting for normal use case? I have tried to copy the init_rc file from audio, omx HAL and the service won’t load up unless I use your sepolicy here. Is there a formal way to tell the system to load up the hal service while booting? i don’t know which init.te file should config, could you tell me the location of init.te file? All available passthrough implementations (all -impl.so files). These may return subclasses through their respective HIDL_FETCH_I* functions. What I am missing here if anyone can help? Also i cannot see the same in ls -a. However I can see the so file in system/lib and in lshal as above. I NEED to use an HIDL service( in CPP) while my client is in java (telephony fw). I need to register call backs in the service from my java module, so that i can receive notifications in telephony when there is an update in the c++ service. Thank you very much for nice tutorial, I am stuck in init.te file. Can you please tell me location of init.te file so i will set the given rules.